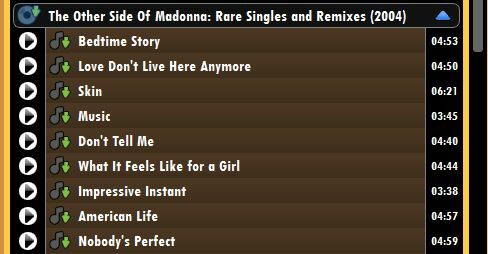 There is nothing easier than downloading whole music albums with MediaDrug. Often when we want to find a favorite song or an artist's discography we spend a lot of time searching for it on the Internet. Now instead of having to search for music through search engines you can use our software to find it. This remarkable software will find your favorite music any time you want - and fast. To download or listen to your favorite music you simply need to enter a query and wait for a comprehensive list of results. With just one click you can enjoy your favorite music. Sheer convenience is what this music downloader provides. Just because you listen to pleasant music does not necessarily mean that you have to download the files to your hard drive. The program will find music that you are interested in and you will always be able to listen to them on command. 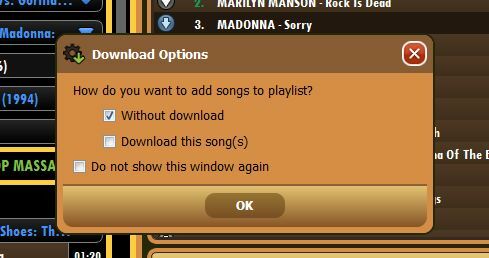 If you wat to save the tracks to your local music collection you can do so easily. Why fill the memory of your personal computer when MediaDrug can save your queries for playback at any time, all without overloading your hard drive. 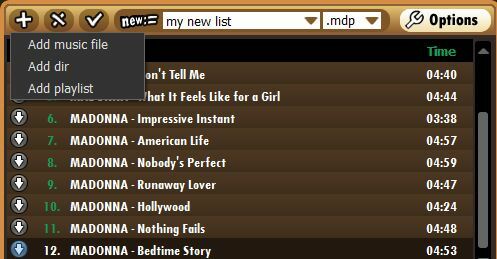 You can store as many MediaDrug results as you want and the program will remember your favorite music. This gives you the opportunity to hear it, directly from the internet, at any time. Many people like to listen to music in playlists and MediaDrug makes it both easy and convenient to create them. To do this, all you'll need to do is move a song from the left side of the window to the right side. You can add songs that are already on your hard drive to a new playlist. With MediaDrug you can also combine multiple playlists. Playlists are very handy if you like to listen to music constantly; who doesn't want to make a sequence of their favorite songs to be played on command? Put together all of the desired songs into a playlist using MediaDrug. Let it do the work for you so you no longer need to think about constantly switching songs. The program has no restrictions on playlist size so your favorite music can be played all day! The system of tabs in MediaDrug is similar to systems used in modern web browsers. It is possible to store history formed from earlier searches. This is very convenient because it allows you to return to your former search results at any time. You can use the tabs to produce new playlists as well. 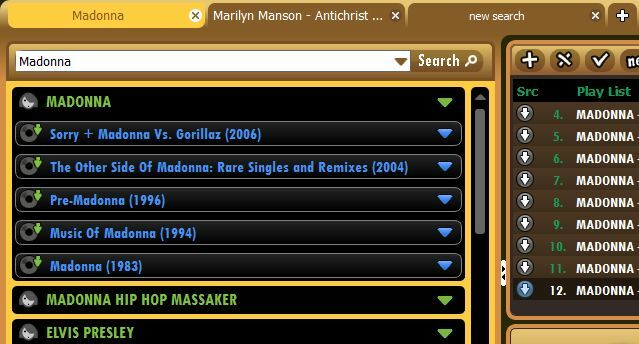 A tab system allows you to search for new music items while fully preserving previous search results. If you are a music amateur, constantly listening to and looking for new music, the history of your searches can become very large. It is incredibly irritating when the music you've searched for is not saved just because the program is not designed to keep a search history. MediaDrug never behaves this way so your mp3 music library will only become larger!